The old phrase "in a pig's eye" has usually been taken to mean either "from a low point of view" or else that a thing is Impossible. And yet, to those of us who possess pig's eyes as part of our Nature, neither meaning applies: that we are closer to the Ground than some other Animals, cannot be denied, but this Perspective has no correlation to our true Stature. Humans, indeed, though they may call someone "a giant of a man" or "a towering figure," do not confuse the metaphorical with the literal by imagining that the Tall are necessarily of greater importance than the Short -- and indeed, many who have loomed largest in history, such as Napoleon Buonoparte, were shorter than most. 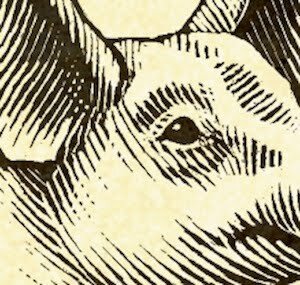 And, as for the phrase connoting a thing Impossible, I am sure that is just a confusion with the similar-sounding "when pigs fly" -- and let it be noted, that while such a thing was unheard of in my time, it is common enough nowadays that it ought elicit no Wonder. For me, the far more pertinent Issue, is how loudly Humans object to reading the views of a Pig regarding their own Species. Were they, by their own kind, peeped out at Infamy, they would complain no less loudly, but somehow, when the Spy is of the Porcine Race, they are far more greatly Embarrassed. Humans have always loved to gawk at those they believe to be their Inferiors, which sight instills Laughter; where as to be stared at by those same creatures, seems to them to add Insult to the Injury, and seems the worst sort of Indignity. I have, in my Memoirs, reflected at my many disappointments in the Human Race, among whom I came without either the ordinary preparations of childhood, or the usual expectations of future Preferment, that would have been natural to Man. And yet, although I could witness many of their Cruelties at closer quarters than most, and despite the fact that, on at least two Occasions, I came very close to losing my Life to them, I do not blame them for my Troubles. For one, in that my greatest Friend and Benefactor, Mr Samuel Nicholson, was of their kind -- and for two, that at every turn of my short Life, there were others -- Dr Adams, Mr Sheldon, and Dr Cullen -- who took my protection and education in hand, and guided me through the most difficult Obstacles. To them all, I shall always be grateful, and for their sake, although I know its faults in a way few others can, I do not condemn the Human race.